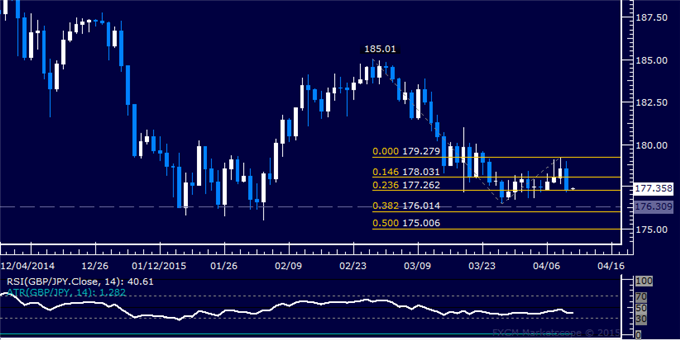 The British Pound turned lower anew against the Japanese Yen, recoiling from resistance below the 180.00 figure. A daily close below the 23.6% Fibonacci expansion at 177.26 exposes the 176.01-31 area (38.2% level, triple bottom). Alternatively, a reversal above the 14.6% Fib at 178.03 opens the door for a test of the April 8 high at 179.28. Prices are too close to support to justify entering short from a risk/reward perspective. On the other hand, the absence of a defined bullish reversal signal suggests that taking up the long side is premature. With that in mind, we will remain flat for now. The US dollar managed to stage a recovery after the previous blows, especially against the majors. A busy week awaits traders with US inflation and consumer data as well as rate decisions in Canada and the euro-zone among other events. Here is an outlook on the highlights of this week. 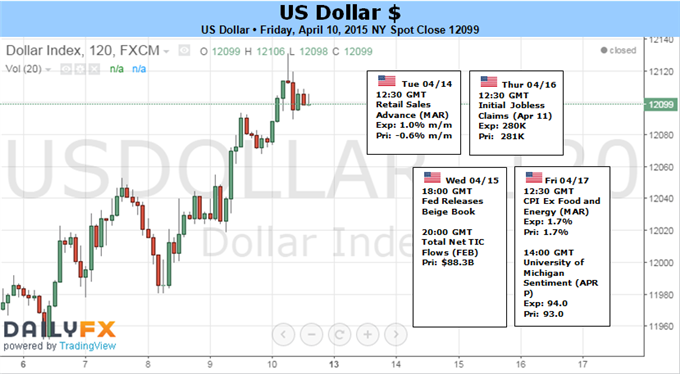 US data began recovering and the dollar followed. The ISM Non-Manufacturing PMI was OK and JOLTs beat expectations. But it was the meeting minutes that provided the greenback with the biggest push: they revealed that in March, some members talked about hiking in June. Despite the known fact about the existence of hawks and the timing of the meeting before the weak NFP, the greenback soared. It probably remains the cleanest shirt in the dirty pile. Elsewhere, Greek worries weighed on the euro, elections worries hurt the pound and the yen also slid. The Aussie stood out, enjoying yet another “no change” decision by the RBA. UK CPI: Tuesday, 8:30. Inflation in the UK reached a flat 0% in February, a figure that alarmed many. Will Britain enter deflation? This could push back any potential rate hike for even longer and also cast its shadow on the euro-zone. Official expectations stand on another 0% read y/y. US Retail Sales: Tuesday, 12:30. For a third consecutive time, retail sales squeezed and disappointed. The fall of 0.6% in February will likely be followed by a bounce in March of 1.1%. Also core sales have followed the same pattern with a drop of 0.1% in February. Also here, a bounce is on the cards: +0.7%. US PPI: Tuesday, 12:30. Producer prices serve as a warm up to consumer prices. After a drop of 0.5% in both headline and core figures in February, rises are expected in both, 0.2% and 0.1% respectively, especially as oil prices have stabilized. Chinese GDP: Wednesday, 2:00. The world’s No. 2 economy has grown at a pace of 7.3% in Q4 2014 and is expected to experience slower growth in Q1. Some say it is inevitable and others say it is wisely engineered by the leadership. Growth in China closely impacts Australia but certainly has implications for the entire world. A slide to 7% y/y is on the cards and as authorities wish to see. Canadian rate decision: Wednesday, 14:00. The Bank of Canada left the interest rate unchanged at 0.75% and is expected to do so once again. After the surprise cut in January, Poloz and his team seemed more optimistic about the economy and hinted that this was not the beginning of a new loosening cycle. How will they sound now? Worries about Q1 growth could be echoed in the statement. Note that the release is followed by a press conference at 15:15. Australian employment data: Thursday, 2:30. Australia enjoyed job growth in February: 15.6K jobs were added. Also the unemployment rate went in the right direction and dropped to 6.3%. In the bigger scheme of things, unemployment is still on the rise and is likely to rise later on in the year. Very similar number are expected now: a gain of 15.1K jobs and an unemployment rate of 6.3%. US housing data: Thursday, 12:30. These figures went in different directions: building permits rose to a promising 1.09 million (annualized) in February, while housing starts stood on 0.90 million. The latter can be blamed on the cold winter weather, while the former is more forward looking. Building permits are expected to stand at 1.08 million (annualized) and housing starts to bounce back to 1.04 million. Note that revisions are quite common here. US unemployment claims: Thursday, 12:30. The weekly gauge of jobs did bounce back from the lows but beat expectations by hitting 281K. Perhaps more importantly the moving average fell to levels last seen many years ago at 282K. It was above 300K not too long ago. A small rise to 284K is on the cards. US Philly Fed Manufacturing Index: Thursday, 14:00. The regional figure is for the month of April, providing a fresh insight on the manufacturing situation. 4 consecutive misses on expectations set the number on 5 points last time. A small rise is likely: 5.5 points. UK employment data: Friday, 8:30. This is the last jobs report before the May elections and carries more political weight. The claimant count change, aka jobless claims, continued dropping quickly in February: 31K. A similar number is probable now – a slide of 28.5K. The unemployment rate is also going in the right direction, and stood on 5.7% in January. A drop to 5.6% is expected. This is what the current conservative coalition government is championing. However, the average earnings index has risen by only 1.8% y/y in January, and this provides fuel for the opposition Labour. A tick down to 1.7% is expected now. US CPI: Friday, 12:30. When looking at the headline number, the US is experiencing deflation, but this is clearly oil-related. Year over year core inflation is actually on the rise, reaching 1.7% in February. Both monthly indicators rose 0.2% last time and could follow suit this time, with +0.3% in the headline number and +0.2% in the core figure. US Consumer Confidence: Friday, 14:00. The Reuters / University of Michigan consumer confidence survey edged up to 93 points in the final read for March. We now get the preliminary figure for April and a higher score is expected: 93.8 points. 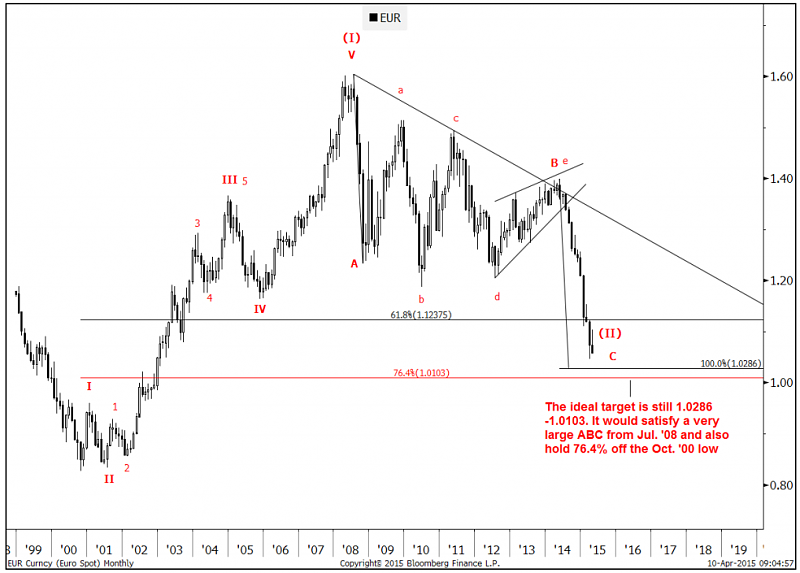 US Dollar Remains Strong, but for How Much Longer? The US Dollar finished the week near decade-plus highs versus the Euro as it rallied against nearly all G10 counterparts. A noteworthy gain in US Treasury Yields helped explain much of the Dollar’s rally, but heavily stretched positioning and price momentum makes further gains relatively unlikely. Global interest rate differentials remain the main driver of major currency moves, and expectations of US Federal Reserve interest rate hikes have pushed the US Dollar to impressive peaks. The US Federal Reserve is in fact the only G10 central bank expected to raise interest rates in the coming 12 months, and as long as this remains the case we expect the US currency to hold its gains against lower-yielding counterparts. Yet there remains clear uncertainty surrounding the Fed’s moves. Further Dollar strength is far from guaranteed. Traders will look to the coming week’s US Retail Sales and Consumer Price Index inflation data for the next clues on the Federal Reserve’s interest rate policy, and major surprises could force important US Dollar volatility. Analysts predict the Advance Retail Sales report will show that consumer spending grew by 1.0 percent March—the first month-over-month gain in three months and the fastest pace of expansion in exactly a year. Lofty expectations leave ample room for disappointment and the odds seem stacked against the US Dollar ahead of the event. Late-week CPI inflation figures represent the biggest risk to the Greenback given their clear implications for the future of US Federal Reserve monetary policy. Headline CPI data is expected to show prices remained exactly unchanged in the 12 months through March, while CPI excluding food and energy will likely match February’s pace at 1.7 percent. Topside surprises could increase the Fed’s sense of urgency in raising interest rates and normalizing monetary policy. Recent FOMC minutes showed a surprising level of support for raising interest rates at the highly-anticipated June meeting, and the jump in yields helped drive renewed Dollar strength. Yet rhetoric is one thing and actions an entirely different matter. Interest rate futures show a miniscule 7 percent chance that the Fed will hike in June—hardly encouraging for US Dollar bulls. Patience may wear thin for those holding USD-long positions rather quickly; recent CFTC Commitment of Traders data showed large speculators were their most net-long US Dollar versus the Euro (short EUR/USD) on record. And though this in itself does not signal that the currency is likely to reverse, it does imply that there may be relatively few traders left to sell. The key question is simple: will interest rate expectations be enough to fuel further Dollar gains? It’s entirely possible, but we’ll keep a close eye on upcoming data given clear risks of an important USD reversal. 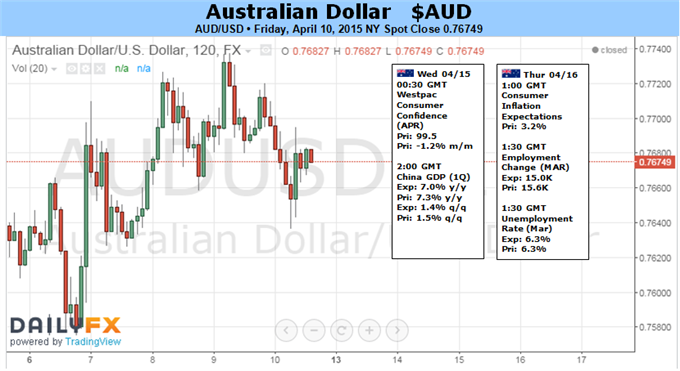 The Australian Dollar snapped a two-week losing streak after the RBA opted against another interest rate cut at April’s monetary policy meeting. The central bank was unmistakably clear about its bias however, saying “further easing…may be appropriate over the period ahead” and pledging to “assess the case for such action at forthcoming meetings”. This makes for a data-sensitive environment going forward as traders weigh up news flow to see when RBA Governor Glenn Stevens and company might pull the trigger. In the week ahead, the March set of employment figures will be in the spotlight. The economy is expected to have added 15,000 jobs last month while the unemployment rate is tipped to have remained at 6.3 percent. Leading survey data points to a significant slowdown in service-sector hiring in March while employment in manufacturing continued to contract (albeit at a slower pace). With close to three quarters of those working doing so on the services side, this is an ominous sign. Furthermore, Australian data outcomes have increasingly underperformed relative to consensus forecasts recently, hinting analysts’ models are overestimating the economy’s vigor and raising the threat of a downside surprise. A disappointing jobs report may help stoke bets on an RBA interest rate cut when policymakers reconvene in May. As it stands, the markets’ priced-in expectations assign a 70 percent probability to a 25 basis point reduction. A similar degree of conviction prevailed ahead of April’s meeting, only to be proven wrong. This means a set of employment figures that builds investors’ certitude is likely to have market-moving potential despite already elevated easing speculation, weighing on the Aussie. Chinese news-flow may amplify any dovish shift in the markets’ RBA outlook. The East Asian giant is expected to report that year-on-year GDP growth slowed to 7 percent in the first quarter of 2015, marking the weakest reading since the post-crisis trough in the first three months of 2009. This bodes ill for Australia, whose economic resilience in recent years has largely relied on Chinese demand for the output of its mining sector. The Australian Dollar’s down move since April 2013 has tracked deteriorating expectations for 2015-16 Chinese GDP growth (as tracked by a survey of economists polled by Bloomberg). A parallel drop in Australia’s front-end bond yields bolsters the narrative, suggesting traders are betting that deteriorating export prospects will undermine overall growth. This will push the RBA into action, denting the Aussie’s yield appeal. A soft Chinese growth print will probably feed such speculation. The euro was down against the dollar for the fifth straight session on Friday, falling to one-month lows as the contrasting monetary policy stance of the European Central Bank with the Federal Reserve acted as a drag. EUR/USD was at 1.0603 in late trade, down 0.51%. For the week the pair lost 3.57%, the worst weekly performance since September 2011. The single currency has already weakened broadly this year after the ECB unveiled a trillion-euro quantitative easing program in January. The bank started asset purchases last month, pushing euro area bond yields to new lows. Demand for the dollar was underpinned by expectations for higher interest rates, as investors regained confidence that the U.S. economy would continue to recover after recent economic reports pointed to a slowdown at the start of the year. The greenback received a boost earlier in the week after comments by the presidents of the New York and Richmond Federal Reserve banks made the case for the Fed to begin policy tightening as early as the summer. Some investors had pushed back the timing of a rate hike until late 2015 after a surprisingly weak U.S. employment report for March. The euro was also weaker against the yen, with EUR/JPY down 0.81% to 127.48 at the close, the weakest since March 16. In the week ahead, Wednesday’s monetary policy announcement and press conference by the ECB will be in focus. U.S. data on retail sales, inflation and consumer sentiment will be closely watched for further indications on the strength of the recovery. The U.S. is to release data on retail sales and producer prices. The ECB is to announce its interest rate decision. The rate announcement is to be followed by a press conference with President Mario Draghi. The U.S. is to release reports on industrial production and manufacturing activity in New York state. The U.S. is to release a string of reports, including jobless claims, building permits, housing starts and manufacturing activity in the Philadelphia region. The euro zone is to produce revised data on the consumer price index. The U.S. is to round up the week with data on consumer prices and consumer sentiment. 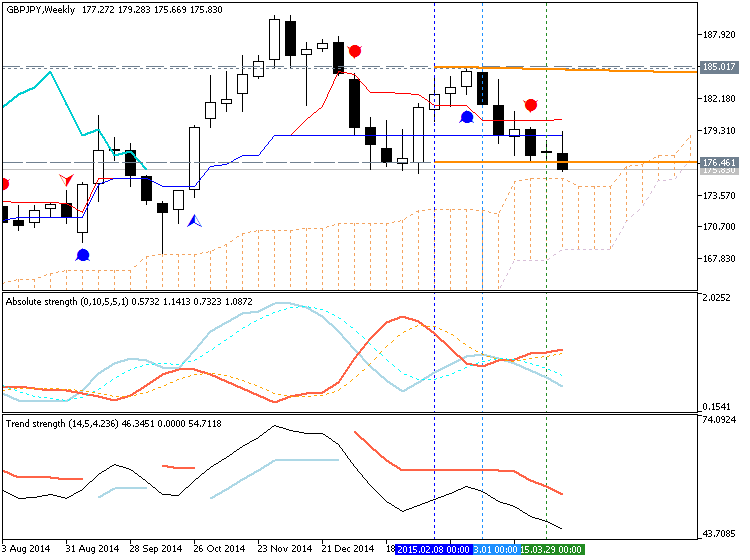 The EUR/USD pair fell hard during the course of the week as the 1.10 level continues to be resistive. The 1.05 level below has been supportive, but it would be only a matter of time before we fall below there in our opinion. 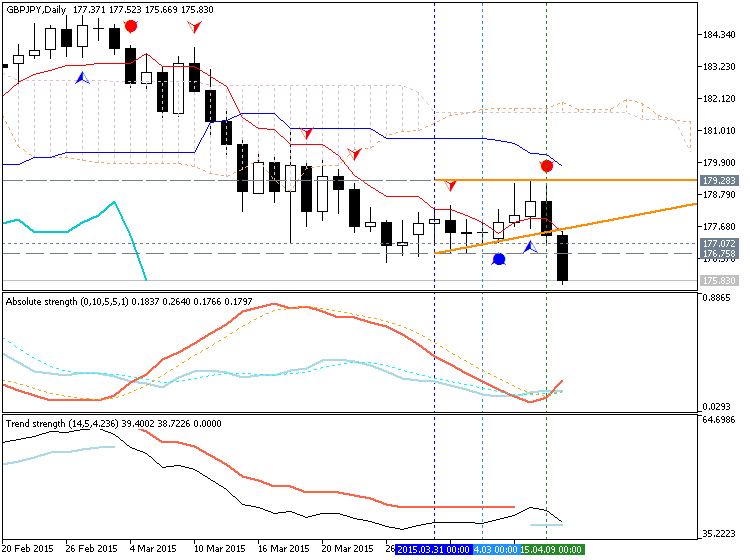 We would head to the parity level at that point in time, and believe that bounces continue to be nice selling opportunities as the European Central Bank continues to offer significant liquidity measures that of course can work against the value of the Euro. We have no interest in buying. Chinkou Span line is very near to be crossed with price from above to below which is indicating the good possible breakdown on W1 timeframe during the current or next week. It peaked on Monday, right underneath an importantresistance area at 1.1052-1.1099. This region included theinterim high (bearish key day reversal) from Mar. 26th, theinterim low from Jan. 26th and the 55-dma. 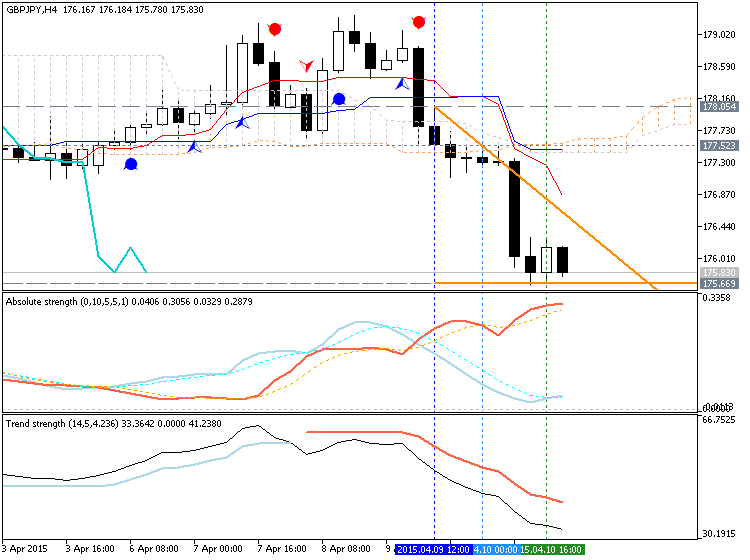 It's since broken lower from a triangle type pattern(ABCDE). Triangles tend to be characteristic of wave 4swhich in this case suits the underlying wave count andimplies that there is further downside potential. 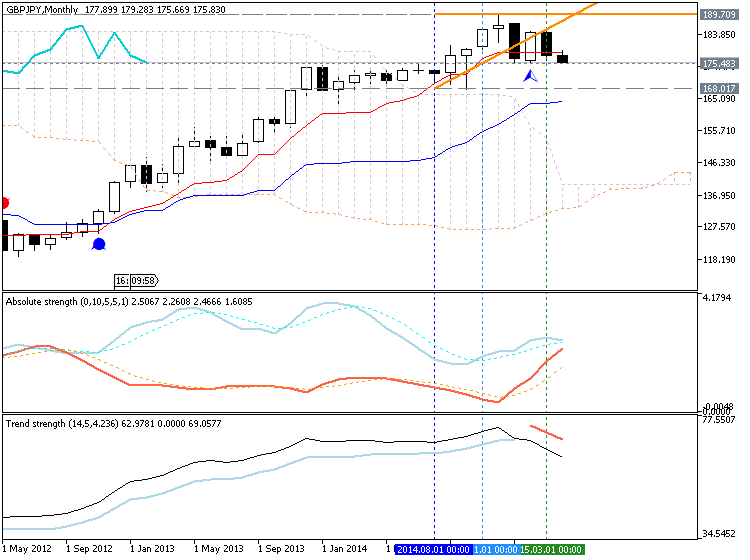 The next near-term support stands down at 1.0487-1.0458 (1.618 extension from Mar. 26th and the low fromMar. 15th). This 1.0286-1.0103 pivot includes 76.4% retrace of theentire '00/'08 rise as well as an equality target taken from the Jul. '08 peak. Reaching it would satisfy a multi-year ABC which began in '08. It would consequently be an ideal place to take on a more neutral outlook. --Starting with the ECB rate decision, TD's base case is that rates will be left unchanged with no significant EUR/USD reaction. --Moving to the open statement, TD's base case (80% chance) is that there will be little to change here and EUR/USD will likely be capped by 1.0715 (minor short-term fibo and double top neckline trigger). --If the ECB upgrades growth risks to "almost balanced" (5% chance), TD sees EUR/USD likely breaking above 1.0715 and moves to around 1.08. --On the other hand, if the ECB language downplays most improvements as far too early to suggest anything (15% chance), TD sees EUR/USD drifting lower but likely unable to break the 13 April low of 1.0521. --Finally, on the ECB Q&E, TD's base case is that Draghi will stick to a cautiously optimistic tone, continuing to reinforce the mantra that the ECB assumes full implementation and will not run out of bonds to buy and has seen nothing in market liquidity to suggest an issue, providing no real answer on questions regarding Greece. 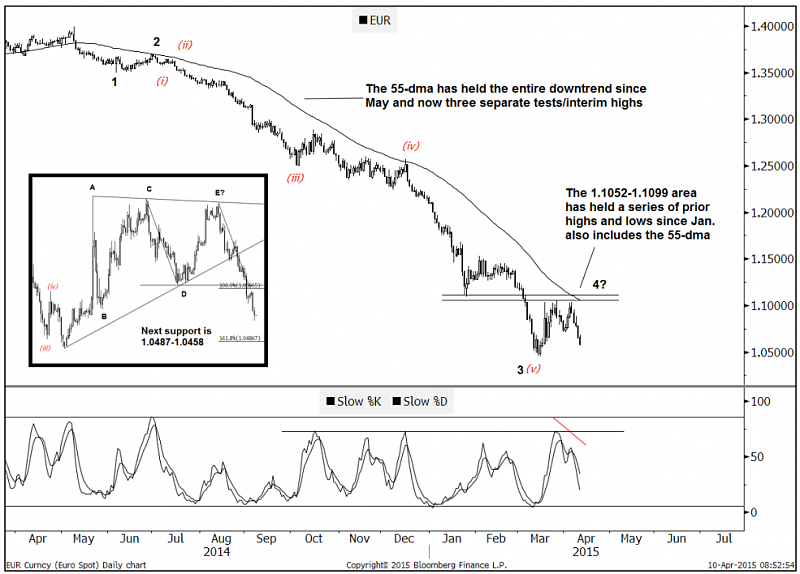 Under this scenario, TD sees EUR/USD likely grinding slightly lower, but unable to break the 13 April low of 1.0521.